Co-Authors Interviewed Today on What’s Your Bottom Line? 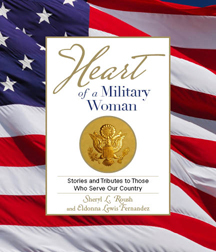 Co-Authors to the Veterans Day release of the Heart of a Military Woman book, Eldonna Lewis Fernandez and Sheryl Roush, are being interviewed today, Tuesday, December 22, 2009, on What’s Your Bottom Line?™ Talk Radio Show by radio host Angie Strader. In this program, listeners will discover the PINK Principles to activate your choices, plus seven Sparkle-Tude!® Boosters to invigorate your attitude and daily life. The focus today is about having consistent success in life… both personally and professionally… and for both men and for women. Our workplace has certainly changed, with high unemployment, people making dramatic shifts in their careers, some staying unemployed, while others are creating their own businesses. Both of our guests have experience in corporate careers, military life and entrepreneurial success. Eldonna Lewis Fernandez is a retired Air Force Master Sergeant with 23 years of honorable military service. She deployed in support of Operation Enduring Freedom. Eldonna has 29 years of extensive leadership, management and supervisory experience. She is certified at Level III Contracts in the Acquisition Professional Development Program. She is also a certified coach, and consultant. Eldonna is affectionately known as the Pink Biker Chic™, a biker and empowerment coach for women she and her “military brat” kids were just featured last week on the premier of Lisa Nichols’ Breakthrough – Original Special on WE-TV. Sheryl Roush is the President/CEO of Sparkle Presentations, Inc., based in San Diego, California. An 8-time entrepreneur since the age of 16, her background is in marketing, graphics, publishing and communication. Sheryl is an internationally top-rated female speaker with 3,000 presentations under her designer belt, and was only the 3rd woman in the world to earn the elite Accredited Speaker designation from Toastmasters International out of 4 million members in 106 countries. She has spoken on programs alongside many highly-regarded celebrities including Suze Orman, Marcus Buckingham and Olivia Newton-John. Sheryl is a 13-time published author and was interviewed December 4th by Montel Williams on his Montel Across America radio show for the Heart of a Military Woman book, co-authored by Eldonna and Sheryl. She was twice crowned “Ms. Heart of San Diego” for her contributions to women and is the creator of the Heart Book Series. What’s Your Bottom Line?™ lives its mission of straightforward discussion about what it takes to be successful in your personal and professional life. 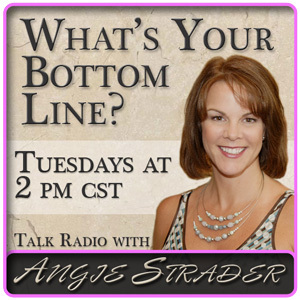 Live talk radio show with Angie Strader in on Diva Toolbox Radio every Tuesday at 2:00-3:00pm CST. Tune in from your computer at http://bit.ly/3rSPwx. This entry was posted on Tuesday, December 22nd, 2009 at 5:18 pm	and is filed under Heart of a Military Woman, Interviews. You can follow any responses to this entry through the RSS 2.0 feed. You can leave a response, or trackback from your own site.